Samsung has announced the launch of its new Galaxy Store, the company has changed the name of its app store. The Galaxy Store will offer a range of apps and themese and more for Samsung’s range of Galaxy devices, it will also offer a range of premium games like Asphalt 9, Black Desert Mobile, PUBG Mobile and more. With Galaxy Store, users can purchase and select a variety of themes and fonts to customize their Galaxy device with a style that suits them via the “My Galaxy” tab, which is accessible directly from the store. Users can also download new camera filters, add a little creative flair to their messages and photos with stickers and stamps, or install new edge panels for even more convenient navigation. A comprehensive collection of apps is available for download from the store, allowing users to tailor their digital ecosystem to match their lifestyles. 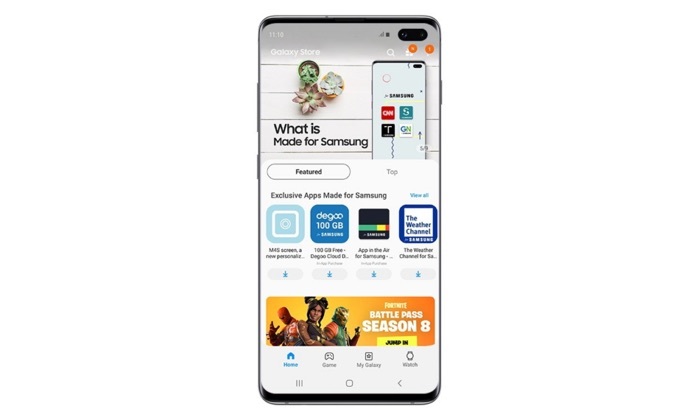 Galaxy Watch and Samsung Gear users can also adjust their watch faces and download apps directly from the phone using the “Watch” tab in the Galaxy Store, while gamers can use the platform’s “Games” tab to discover the hottest mobile games. You can find out more details about Samsung’s new Galaxy Store over at their website at the link below.